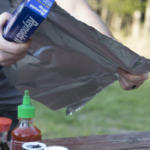 You should always oil the side of the foil that will be touching your food. Butter adds terrific flavor and is called for in many recipes, so you can just wipe butter on the foil. However, cooking spray is much less messy and gives you a perfectly even coat of oil across the entire surface. 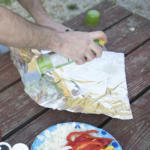 Cooking spray has so many great uses (even lubricating your fishing reel in a pinch) that a can should be a standard part of your outdoor cooking kit. The only warning … do not spray it directly into or around an open flame or intense heat source. 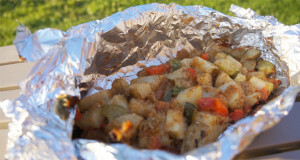 Cheap, off-brand aluminum foil is NOT what you want for cooking foil packets. 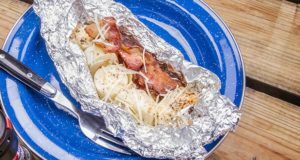 You’ll be much happier with the results of heavy duty foil. Even then, we recommend double packeting. Wrap the food in a packet. Seal it well. Then wrap the packet in a second packet. This really helps cut down on the punctures that will let the delicious contents of the packet to escape before you wan them to AND double packets can help cut down on burned food, too. When closing your foil pack, try to exclude as much air as possible. You want minimal air inside as it will expand when heated. This can open your pack during cooking and that’s not good. 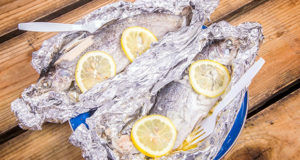 The reason food from a properly prepared foil pack is so moist and tender is because it is steamed in it’s own juices (and those you add). 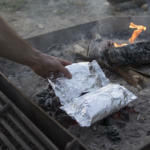 If the pack opens or there are holes in it, then all that moisture escapes and your food will be dry and probably burned. Yech! 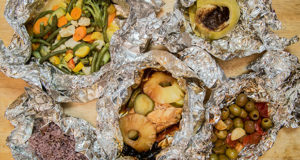 One side of aluminum foil is shiny. The other is dull. 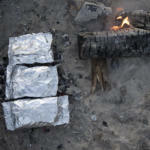 Does it matter which is in and which is out when you’re cooking in foil packets? Nope. The only appreciable difference is the way it came out of the machine that made it, so don’t worry. 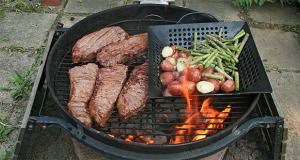 Just spray the side you’ll put the food on with cooking oil and you’re good to go. 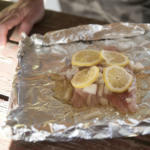 UNLESS, you’re using non-stick aluminum foil – then be aware the non-stick coating is on the dull side! 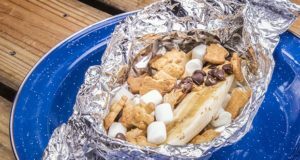 To prevent burning and to cook the contents evenly, turn and move foil packets often when you are cooking on top of a heat source – whether that’s campfire coals, a grill or whatever. 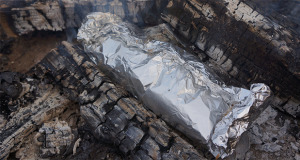 If you’re heating the packet in an oven or burying it in coals, then it will be getting heat from all sides anyway. 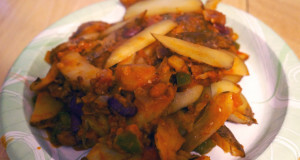 When you’re cooking it that way, you’ll probably need to reduce your cooking time by a bit to avoid overcooking. 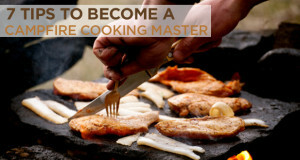 The best way to handle and turn a pack on the fire is with a good pair of cooking tongs that gives you firm but gentle control. They are WAY better than reaching in and using your fingers to flip. 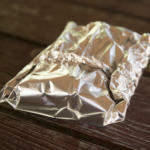 You’ll end up tossing the pack around with your fingers which can result in punctures or the packet opening up. A silicone grill glove works the best of all, but not everybody has one of those.